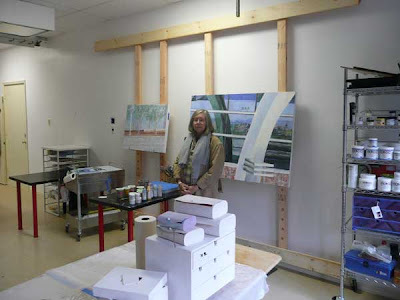 When I lived in Phoenix, I had a small studio. Jim built me a wall easel, an ingenious device which allowed me to paint large without taking up much space. The wall system was designed so that the spacing could be adjusted to allow for different sized paintings. 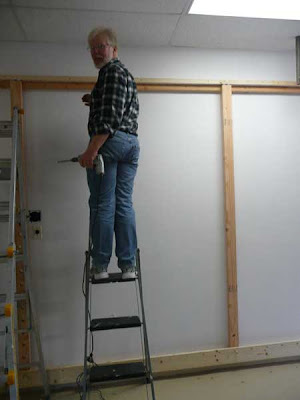 When we moved to Ajo, the wall system no longer worked, because of the very high ceilings in our apartment. Since we were renters, we couldn't do damage to the walls. I ended up buying an easel. It was okay, but took up a lot of space, and was never as stable as I would have liked, being as I get pretty aggressive with canvas/panels as I paint. Now that I have a good sized studio of my own, and messing up walls isn't an issue, I asked Jim if he would reconstruct my beloved Phoenix system. Well, he did and then some! Here's Jim, making sure the holes are drilled in the right places. Off holes mean crooked paintings. Can't have that or else it would drive me crazy. Here are the painting holder thingies. 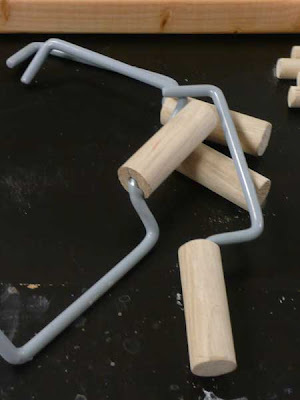 They're made of dowel with ladder hooks screwed into them. The dowels fit into the holes. 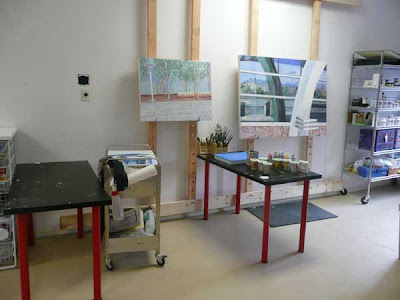 There are four, because the new system has four vertical boards so that I can work on two paintings at a time. The horizontal board at floor level is actually kind of a runner. There's a groove behind it for the vertical boards to go into. Holes are drilled every 6 inches. 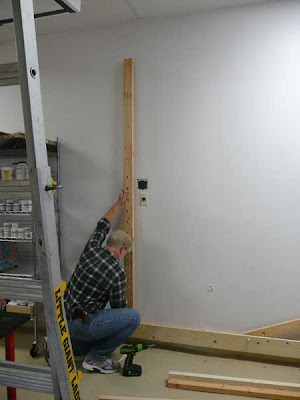 The vertical board is placed into position and secured with a short dowel. Here's Jim, putting the top railing up. A flat board goes over the front of this (see bottom photo). The verticals sit between the groove and the front board. Some very clever items allow the vertical boards to slide in the grooves to the position I want them in. There are casters (little wheels) on the bottom of each vertical board. On the top are gliders. 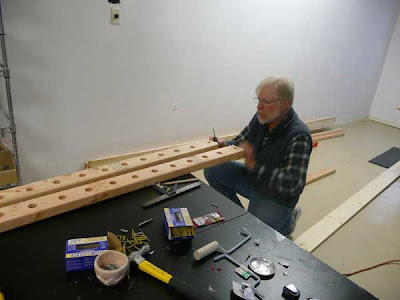 I slide the boards along, get them into position and secure them with dowels. I adjust the painting holder thingies to the right height. And I'm in business! Here are two paintings in progress, all set up on the new system. If you look at the lower bar, you can see that I have plenty of room to increase the width. I can paint huge. 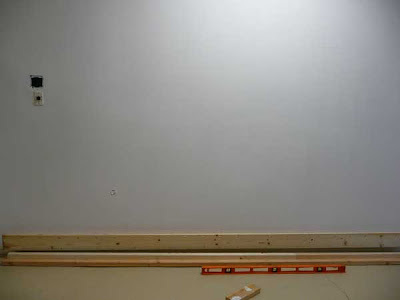 I'm getting ready to stretch a 48" x 60" canvas. The first time I've been able to paint this large in a long time. And I could go even bigger. If you look closely, you can see the painting holders hooked around the bottom of the paintings. And here I am, ready to get to work. This new system is way better than any easel. It's sturdy. It's adjustable. It doesn't take up floor space. Thank you, Jim. My hero! Sheer genius! Props to you and the Easel Rack Builder! What a great idea. You must be in heaven! Yes, both Pat and Quinn, I am in heaven. Thanks for reading the blog.